They have been imported to many other countries throughout the world. 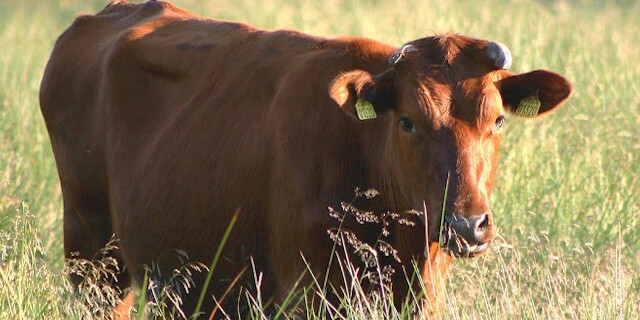 They have been used for improving many other local breeds such as Estonian Red, Latvian Red, Belarus Red, Lithuanian Red, Polish Red, Bulgarian Red, Tambov Red, or Russian Red cattle. They are also popular for crossbreeding in tropical countries. Their solid red color has helped make them popular for crossbreeding in the tropical countries with red Zebu dairy breeds like Butana, Red Sindhi, and Sahiwal cattle. They are noted for their milk production, and the cows can produce very good quality milk. They can also be used as a beef breed once they have finished their useful lifetime. They accounted 61 percent of Danish cattle stock in the early 1960s, and this number had declined to a little over 20 percent by the early 1980s. Today there are over 42,599 pedigree cows in Denmark. Danish Red cattle are medium to large sized. Their coats are usually one solid color, red, with little variation. The bulls often have a much darker red tinge. Both bulls and cows usually may have small horns. The cows show a typical dairy conformation and they have good sized and well-developed udders. Average live body weight of the mature cows is around 660 kg. The bulls are much larger than the cows. And average live body weight of the mature bulls is around 1000 kg.